NASA and SpaceX counted down Saturday to the launch of a new astronaut capsule on a week-long trip to the International Space Station and back—a key step towards resuming manned space flights from US soil after an eight-year break. This time around, the only occupant on board SpaceX's Crew Dragon capsule will be a dummy named Ripley. But if the test goes smoothly, NASA plans to put two astronauts aboard by the end of the year. The new capsule will blast off aboard a rocket built by SpaceX—run by billionaire Elon Musk—at 2:49 am (0749 GMT) from the Kennedy Space Center at Cape Canaveral, Florida. It is scheduled to reach the ISS by Sunday, with a return to Earth next Friday. NASA announced weather conditions were good head of the launch, with an 80 percent chance of favorable weather. SpaceX chief Elon Musk, who founded the company in 2002, was at the space center for the occasion. "This is a critically important event in American history," the head of the US space agency, Jim Bridenstine, told reporters, with the rocket and capsule visible behind him on the legendary launch pad where the Apollo missions to the Moon began. "We're on the precipice of launching American astronauts on American rockets from American soil again for the first time since the retirement of the space shuttles in 2011." The excitement was palpable at Cape Canaveral, from the space-fan volunteers guiding media on site, to the tourists who came to watch the launch light up the overcast skies. "It's been a long eight years," the Kennedy Space Center's director Bob Cabana, a former astronaut himself, said as SpaceX employees milled around the rocket. After the shuttle program was shuttered in July 2011 after a 30-year run, NASA began outsourcing the logistics of its space missions. It pays Russia to get its people up to the ISS orbiting research facility at a cost of $82 million per head for a round trip. 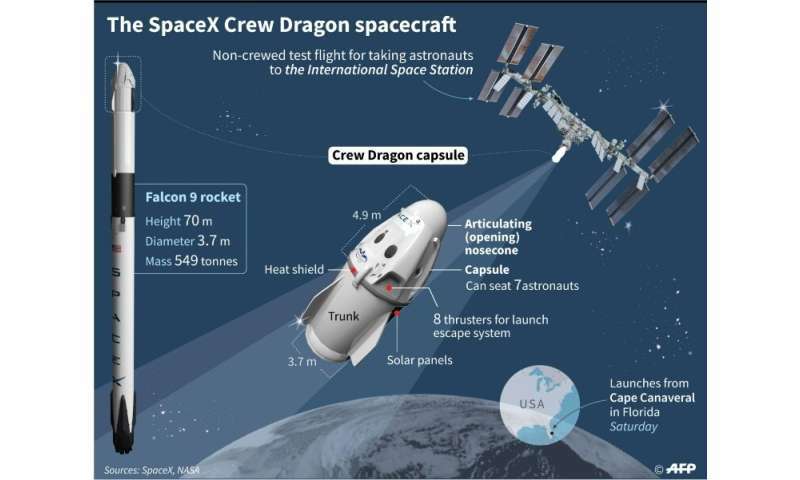 In 2014, the US space agency awarded contracts to SpaceX and Boeing for them to take over this task. 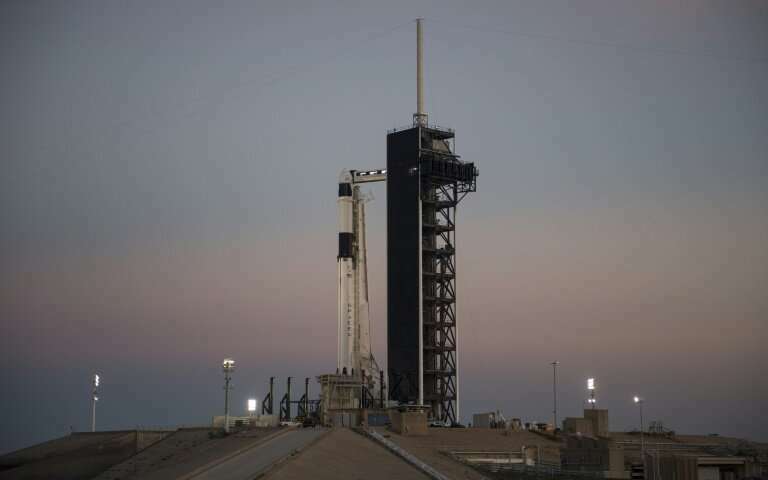 But the program has suffered delays as safety requirements are much more stringent for manned flights than for unmanned missions to deploy satellites. "We're going to have more access to space at a better cost than at any point in human history," said Bridenstine, adding he was "100 percent confident" that a manned flight would happen by year's end. Boeing also received a contract in 2014 to develop a space vessel, the Starliner. It will not be tested until April, in a mission similar to SpaceX's. NASA did not want to rely on just one single vehicle, in case of accidents. "We're going to be a customer," Bridenstine told reporters. Planning has been delayed by around three years, with the first manned SpaceX flight still penciled in for July, though officials frequently refer to the end of 2019 as a more realistic deadline. "We're going to take it day by day," Bridenstine said of the timeline. "Right now, the date is July and that's what we're planning for, but if we change that date we'll make sure people know when it's the right time." Doug Hurley, one of the two astronauts chosen for the future first manned flight, said: "We will be ready when SpaceX and NASA are ready for us to fly." Saturday's flight aims to test the vessel's reliability and safety in real-life conditions. The dummy that will ride in the capsule—which SpaceX's Hans Koenigsmann prefers to call a "smartie"—has been nicknamed Ripley in honor of the character played by Sigourney Weaver in the "Alien" movies. It will be fitted with monitors to test the forces that future astronauts will be subjected to on takeoff and when they return to the Earth's atmosphere and then splash down in the Atlantic, slowed down by giant parachutes. "We're going to learn a ton from this mission," said Kathy Lueders, the manager of NASA's Commercial Crew program. For SpaceX, sending an astronaut into orbit would be a culmination of years of hard work and high-risk investment. "Every mission is important, but this is even more important, said Koenigsmann, the firm's vice-president for build and flight reliability. "Early on, our goal was human spaceflight," he said. "Human spaceflight is a core value of business of SpaceX." In less than a decade, SpaceX has become a key partner for NASA, in addition to dominating the market for private satellite launches. Its Falcon 9 rockets have resupplied the space station 15 times in seven years, even though one of them blew up in 2015. Other than that - Go SpaceX! Nutty Elon Musk's death machine.